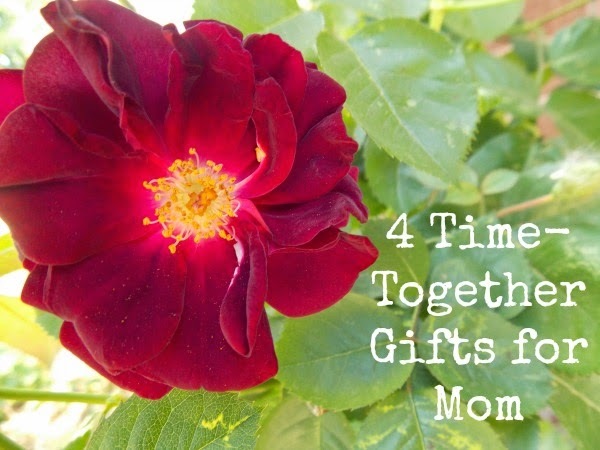 Moms love having time with their kids, so instead of spending money on another trinket your Mom will have to store somewhere, why not give her the gift of your time and attention? A mom's life is full of stress, give her the gift that helps her relax by giving her a massage or taking her for one. It doesn't have to be fancy to be heavenly. Fix her the "mom meal" you most remember from your childhood (even if it's hot dogs and baked beans) and tell her what it means to you. Have fun reminiscing around the table. Take a walk or a drive somewhere she's never been. Take snacks, water and detailed directions; or if you're both adventurous, just start driving and see where the road takes you. Let her choose the activity and you set up a time to enjoy it together. She enjoys the date and gets time with you, it's a win-win! What ideas do you have for Mother's Day? I like the neck massage or even a girls day out...lunch and shopping. Pretty much anything that results in spending quality time together. Girls day out sounds really fun, Angela. I'd also take a foot massage but doubt my kids would be eager to do that, ha! This would be so nice if my mom lived in town. But I did write her a card, and even managed to send it on time. My mom has a gift for picking out the perfect card, like those people you see in Hallmark commercials. I wrote mine my hand, and it seemed really sappy (which I generally am not), but it was heartfelt and true. I think she might cry when she reads it. Rebecca, getting a personal message like that is my favorite. I would cry too! I think she'll love it.